Reese’s Peanut Butter Blondies topped with M&M’s and stuffed with chocolate goodness! This blondie dessert is a fun twist on the traditional blondies and makes the perfect Easter treat! I love a good cookie bar. Whether it’s one of these peanut butter blondies, congo bars, M&M cookie bars, peanut butter bars or sugar cookie bars, I don’t discriminate. 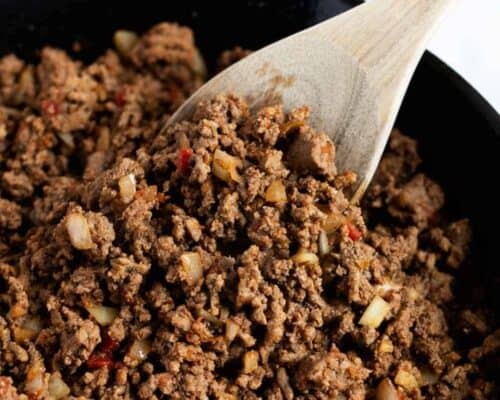 :) They’re easy, delicious and packed with so many yummy ingredients! If you’re a peanut butter fan, you’re going to love these peanut butter blondies! 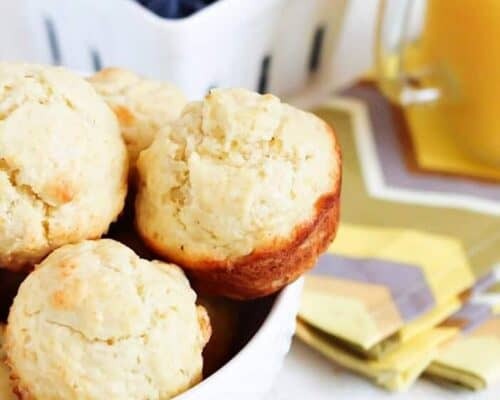 They’re loaded with peanut butter flavor and are so rich and chewy. They bake to perfection and are soft in the middle, yet crispy around the edges. Mmm…so, so good! 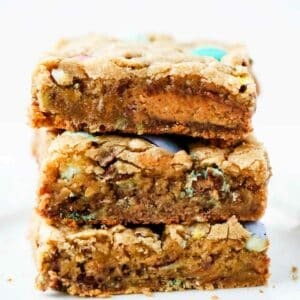 This blondie dessert tastes like a mix between a classic blondie, M&M bar and peanut butter bar. It’s got a great ratio of peanut butter and chocolate flavor and is absolute heaven. You’ll need a large glass of milk with these tasty bars. Perfection! Scroll down for the printable peanut butter blondie recipe. Preheat oven. Preheat oven to 325°F and grease a 9×13 baking dish. Then lightly dust with flour or line with foil. Mix together ingredients. In a large bowl, cream together butter and sugar. Add in eggs and vanilla and stir until combined. In a separate bowl, whisk together the flour, baking powder and salt. Pour flour mixture into wet mixture and stir. Then fold in chocolate chips and M&M’s. Assemble dough in baking pan. Flour your hands, then press 1/2 dough into the pan. Cut the Reese’s into small pieces and lay on top of dough. 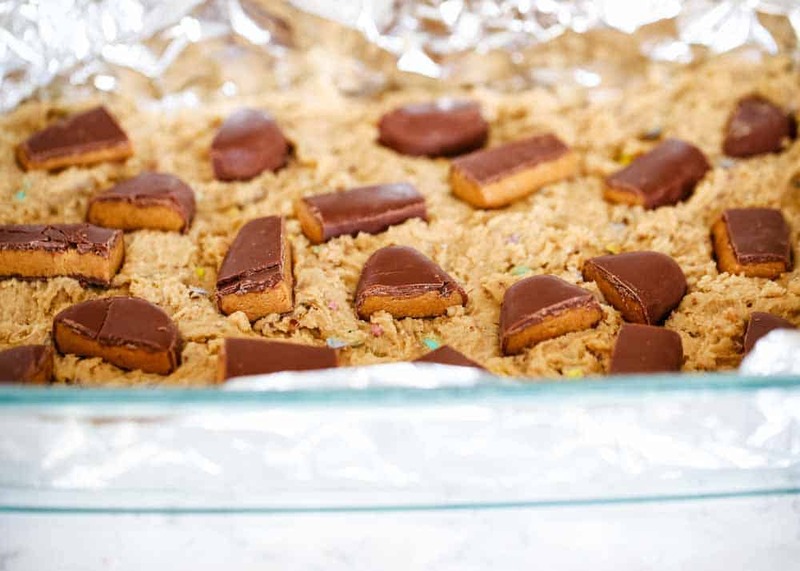 Then press remaining cookie dough on top of Reese’s (add extra M&M’s on top if you’d like). Bake. Bake for 30-40 minutes, or until lightly browned and toothpick comes out clean. 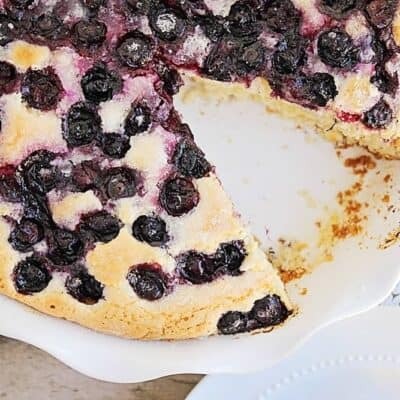 The dough should be soft in the center. Let cool and enjoy. Allow bars to cool completely, then enjoy with a cold glass of milk! Can I freeze peanut butter blondies? Yes, peanut butter blondies freeze very well. To freeze, simply wrap in foil and place in an airtight container or freezer bag. The blondie dessert will keep in the freezer for up to 3 months. Line your baking dish with foil for easy removal. For extra peanut butter flavor, use peanut butter chips instead of chocolate chips. Use festive M&M’s around the holidays, like Valentine’s, Easter, Halloween and Christmas. Don’t overcook! They may look a little soft, but they’ll harden as they cool. Use a toothpick to make sure the center of your peanut butter blondies comes out clean. 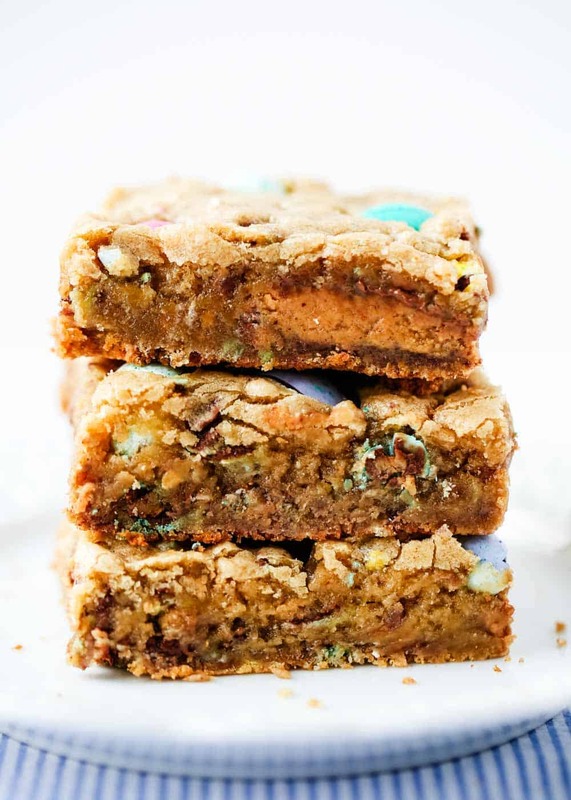 Reese's Peanut Butter Blondies topped with M&M's and stuffed with chocolate goodness! This blondie dessert is a fun twist on the traditional blondies and makes the perfect Easter treat! Preheat oven to 325°F and grease a 9x13 pan. Lightly dust with flour or line with foil. Cream butter and sugar in a large bowl. Add in eggs and vanilla and stir until combined. In a separate bowl, whisk together the flour, baking powder and salt. Pour into the butter mixture and stir. Fold in chocolate chips and M&M’s. Press 1/2 the dough into the pan with flour on your hands. Cut the Reese's into small pieces and lay them on top of the dough. Place the remaining cookie dough on top of the Reese's. You can add extra M&M’s on top if you’d like. Bake for 30-40 minutes or until lightly browned. Oven temps will vary. Test with a tooth pick. 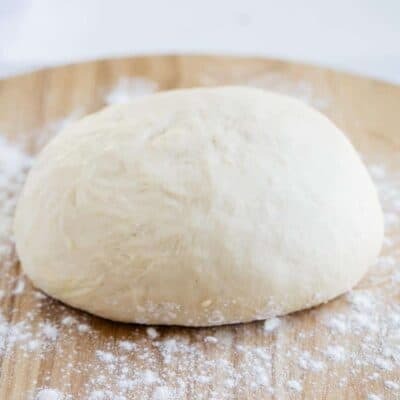 The dough should be soft in the center. Allow bars to cool and then enjoy with a cold glass of milk! Alternatively you could use reeses pieces instead of peanut butter m&m's. These would be the death of me!! So, so good! 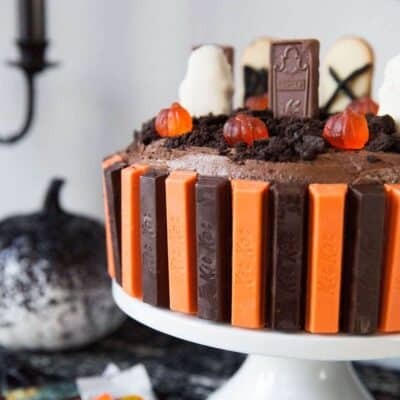 Love reese’s in desserts! Anything peanut butter is my favorite and this sounds so so good. Mmmmmm, Brownies… and Peanut butter! Thanks for the recipe! These look great, just what I was searching for!!! What is pictured on top of these and when did you add them?? I love your recipes! Just tried the blondie one, but confused w/the 2.5 cups in the recipe list and then the 1 cup in the directions. I used 2.5 cups and ended up w/blondie bread. Which isn’t a bad thing…. The directions say add 1 cup of flour and then in the next step it says add the rest…..
Hi Becky! You will be adding 2 1/2 cups of flour total, sorry for the confusion! 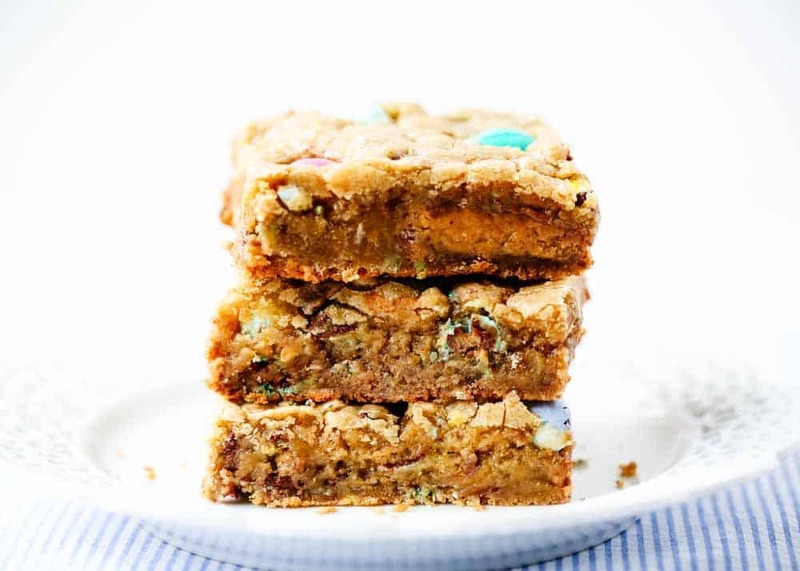 Reese’s are always a welcome part of any dessert with our family … love how you made these Blondies pretty for Easter! Love this twist on the classic blondie! Can’t wait to try it! Wow! Hard to believe Easter’s only a few short weeks away! These pretty Blondies are sure to please!